How can Jo-Kin save Captain Astra and the Galaxy from the dreaded It? Humorous space adventure with problem solving, science and STEM themes. How can Brian Bennett stop the bully before it’s too late? Brian life is falling apart: his dad abandoned the family, Brian hates his new school and now he’s bullied every day. A humorous fast-paced story to empower kids to live strong with bully prevention. FREE teacher resources. Endorsed by Kids Helpline. How can bailey beat the BLAH and change the blah to HA-HA-HA ? Bailey hates everything about his life: His tummy aches, he can’t get out of bed, his dog slobbers over him, he hates his school, and he has no friends. An empowering picture book to lift a child’s mood. FREE teacher resources. Endorsed by Kids Helpline. How can Harry help Grandpa remember again? Harry will do ANYTHING to help grandpa. 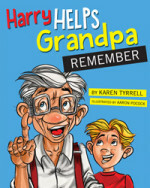 Harry finds ways to boost grandpa’s memory and coping skills. Uplifting picture book for kids & grown-ups to raise awareness of memory loss and dementia. FREE teacher resources. Winner RADF Grant. HER ─ manic, psychic, healer to the living, telepathic to the dead … and she was insane. What shock secrets are behind Me & Her: A Memoir of Madness? How can you recover from depression, bipolar, anxiety and PTSD? Self-help manual shares Karen’s 30 steps to recovery: sleep better, stress less, find your happiness and stay well from CARER’S perspective. Endorsed by Black Dog Institute for suicide prevention. Didn’t twig that you have your own publishing company – DFP. This is where your books are published. Well done. ✨When is your mental health talk in October? So impressed at you and your team’s hard work. Thanks for dropping in again. YES! DFP is our publishing imprint. 9 of our books are published there. We’re speaking at the Brisbane Convention Centre to an audience of 250 invited mental health network guests.